Isn’t it interesting how hypocritical we are about money? Yet when it comes to our new iPad or computer or trip, it’s different. We look at others’ spending and deride it as frivolous and unnecessary, yet we use cognitive dissonance and other mechanisms to justify our own spending. And we’d never expose our spending to the light of outside scrutiny. I’m working on a monster post about how hypocritical we are with money — and especially how we believe that “money=evil” in America. If you have any stories to share, let me know in the comments below. Have you judged others for their spending? Been judged? What do you think of someone paying $1,000/night on a hotel room or $500 on a pair of jeans? What about an iPad? Stay tuned for the larger post. If you’re interested in the single-best book on how we’re cognitively wired to blame others but not ourselves, read Mistakes Were Made (But Not by Me): Why We Justify Foolish Beliefs, Bad Decisions, and Hurtful Acts by social psychologist Eliot Aronson (whose class was one of the best I took at Stanford). It is absolutely chock-full of psychological insights and will give you tools to analyze/understand friends and co-workers in virtually every social situation. Also, you might notice some minor design changes that rolled out on iwillteachyoutoberich.com last night. We’re doing ongoing testing. I agree that there is hypocrisy but the main issue I have when people make those extravagant purchases is that it’s usually because they can’t afford it/I know that they’ll quickly tire of them and look for another fix/they are just getting it to keep up with the Jones’. I read somewhere that our use of the word “money” is wrongly applied. Money is a tool. In the same way a spade is a tool. So it doesnt make sense if someone said “spades are bad”. Or that person has too many spades. Or using too many spades is wrong in this climate. Or “I love spades!” Its laughable. It made me think a lot about how we have completely misused the idea of money. Its only a tool. Looking forward to the post Ramit. Oh wow do you don’t to chat with me? Two things: Sometimes it’s a matter of not removing the log in our own eyes before worrying about the speck in someone else’s. Occasionally it’s just a matter of different priorities. I see this all the time. Sometimes I catch myself internally saying “What the hell was she thinking.” but as you say we all have different priorities. I too have been judged. Each year I go out to Las Vegas for a week long conference. During that week I take Vegas up on their amazing chefs with my average dinner bill being $250.00. Some of the people I work with think I am crazy for spending that much on dinner but my taste buds tell me otherwise. Meanwhile the majority of the people I know will end up eating at one of the cheapest all you can eat buffets they can find, followed up by $200 dollars of gambling while they digest the culinary abortion they just consumed. I’ve justified it to myself in the sense that I only do it once a year and I don’t go into debt doing it. Since I can afford it, and do enjoy fine dining, I go by the motto ‘When in Rome’. I do this pretty regularly. As I’m not into nails, hair and makeup, I look down on people who spend a lot of money on these items. But the books, CDs and gourmet food I spend my money on – well, that’s educational or health related right? DH and I rotate back and forth on calling the other on running supplies (usually whoever most recently bought a nice new pair of shoes) It’s silly but at least (usually) we can laugh at ourselves. I’m with others who say, so long as they don’t go into debt to do it, it’s their money. But I still reserve the right to tease mercilessly. I don’t know the exact financial situation of most people in my life, and living well is great if you can afford it. But, if someone mentions how broke they are just weeks before going on vacation to a $300/night hotel – let the judging begin. Or, when someone you just loaned money to gets their computer upgraded (which they don’t use for work), and tells you about other frivolous purchases they’ve made – judge away! I have a lot of friends that will sit around and talk about how people spend their money, what they choose to spend it on, etc. I always try to challenge those little judgement sessions. I think everyone has or should have something that they are willing to spend a premium on- it makes life more enjoyable. The trick is to make sure you save and budget for those expenses. As long as you’re not going into debt, who are we to judge how you spend your money. I was once out for drinks with some acquaintances and someone asked what the most expensive “splurge”, unplanned purchase we had ever made was. Some said a stereo, a handbag, when it was my turn I had to say “I spent $500 on the cowboy boots I am wearing right now.” This was in Chicago. They all looked at me like I was nuts- at that time I was working as a full time volunteer with a stipend of $20 a week. I am actually riddled with indecision about finances because I think of people who live on $1/day when I buy lattes, or clothes. I do give charitably but Dorothy Day’s injunction that to have two coats means one is stolen from someone in need just stays with me. I would like to hear this addressed as to how to best leverage our own security and finances in order to make the biggest impact. Wow $500 cowboy boots. You go girl! I love shoes so I know how tempting that can be. If you can afford your boots and paid for them responsibly then you shouldn’t feel guilty. If it helps you can always donate one old thing for every new thing you buy. Whenever I start to buy more clothes for my closet I take out some old things I no longer wear that are in good condition and donate them to Goodwill or some other organization. I also donate to United Way monthly and try to give of my time however I can. Enjoy those boots. I’m constantly judged on my wedding expenses. I can’t begin to count how many disapproving looks I’ve gotten from friends and relatives (especially the future in-laws) who have caught wind of how much we’re spending. The reality, of course, is that I paid for most of my engagement ring myself with money from savings, and the wedding will be paid in cash, thanks to an aggressive monthly savings plan on my end. My fiance is investing little to none of his own money, because a big beautiful wedding is my dream, not his, and I make enough money to be able to afford it without having a negative impact on the rest of my budget. The worst part is that my friends and family KNOW that I make enough money to be able to afford it, yet they still judge me for choosing to spend my money how I want to spend it. It’s one thing if someone is drowning in debt and is continuing to rack up expenses, but if someone is financially stable, stop judging them for what they choose to purchase! Your wedding plan is straight out of Ramit’s book: spend extravagantly on what you love and cut costs mercilessly on what you don’t. Don’t let anyone give you crap. Have an awesome wedding! Ramit, I know it’s slightly off topic, but I’d be very interested in what you have to say about grown-up children’s judgements of and influence on their parents’ financial behavior. When do you say “Well, they’re grownups and they can make their own decisions.” and when do you say “I need to step in because I’m going to end up supporting them if they made enough bad decisions.”? Obviously this area is riddled with psychological landmines, from childhood fears to inter-generational politics. I used to be part of a sales organization – on the tech side. Salespeople [most, tho’ not all] are constantly looking for ways to display their success – part of it is just to flaunt it because a big ego can contribute to sales success, part of it is to flaunt it because it helps them make the next sale (whether the customer is impressed, the boss is impressed, or the next hiring manager is impressed), and part of it is to give them credibility at their next meeting (Wow! He’s got a Rolex. He must know what he’s doing!) While the tech contributors were critical to the success of their sales strategy, as we were not paid as well and also typically flaunted less, we were not considered serious business people and our opinions were, therefore, of less value. It’s like how every driver is either too slow or too fast, but we’re perfect. I have never really thought about that. I don’t usually judge my friends who spend less than me. I assume either they have more debt and are taking care of that first or they value other things more also. I had one friend who would buy all of her clothes from goodwill. She loves clothes more than anything and wanted lots of them so she bought them at a discount. Her $900 worth of clothes takes up way more space than the $900 that fit in my one closet. I have never judged her shopping for things that cost $3-5/piece versus me spending $10-15. I usually shop at New York and Company when I have city cash or things are 50-70% off and it makes me happy. Quality pieces at a good price and yet my friend still looks way more stylish than me and I love her for showing me I can shop for even less and look twice as fabulous. Lucky me she is a wardrobe stylist and is now in charge of my look for less. Frugal/cheap who cares. We all spend on what is important to us. Its ok to treat yourself occasionally. I don’t believe most people think money itself is evil. I can promise you that there are LOTS of people that have an understanding of money — or rather, having a lot of it — as being evil. This usually manifests as guilt on the part of the person holding money, as if it is somehow bad that they are in possession of it. For more elaboration, I will wait to see what Ramit says about this first, and will comment further on his post if I find it necessary. I agree with this to a point. Some people have lives that revolve around money and the status they thing they gain buy possessing it and things other people don’t have. I wasted raised that way. I don’t have a love of money. I make money to afford the bare necessities and go on with day to day life. My one splurge a year is a nice trip out of the country. The funny thing is that I try to live as frugal as possible while maximizing my fun. Why put a high price tag on life/fun? Money isn’t everything. It’s also serially misquoted. You’ll frequently hear, “Money is the root of all evil,” which gives a vastly different meaning. I think the previous verse to the one above is also interesting: “People who want to get rich fall into temptation and a trap and into many foolish and harmful desires that plunge men into ruin and destruction.” (v. 9, NIV) So greed can lead you places your intellect never intended to go. Reminds me of the typical embezzlement case. Invariably, someone needs to cover their lifestyle (greed) and off they go, forging checks or skimming. How right you are about our hypocritical behavior with money! I am certainly guilty. I have no problem spending $100 on a new hairstyle, yet chastise my husband for spending a few dollars on snacks at the convenience store. I try to be as frugal as possible in most areas of my finances such as clipping coupons and shopping specials at the grocery store while others like the hairstyle example I tend to splurge. To each his own I guess. I just bought my niece your book. She is the clear money winner in the family but is frustrated by her parent’s and their spending. It can get a little crazy if you are fiscally conservative and living people who spend their money in different ways. When I have told people I want to be rich they tell me rich people are not happy. Oh yeah I am a jumping for joy poor person? I’d much rather be unhappy and paying bills with ease then the other way around. Courtney, that’s easily fixed. Send him this: The $28,000 question: Why are we all hypocrites about weddings? Then send him this: The STFUDF Technique. Then rub your hands together and smile grimly in satisfaction. my fiancee buys little electronic toys for himself all the time, and who am i to judge? i love it when he sits down and makes music with his drum machine or pulls apart electronics to frankenstein them back together. it’s his money, it’s his hobby. thankfully he doesn’t judge me either for the things i want to spend money on- if i want a pair of $300 shoes, as long as i can pay my share of rent then he won’t say anything (well, he’ll tell me how great they look). wedding issues are something else altogether. i’m trying to put together a budget wedding, and some people are just anti-celebration. why don’t i just go to city hall, it’s cheaper? because i want to have a wedding, dammit! it’s such a personal thing, between style and budgets, but boy everyone’s got an opinion. unfortunately none of them agree with mine, but oh well- thankfully i’m the one planning it! I recognize that there are many things I would never spend money on that other people will, and indeed often do. But I do tend to criticize still, when I know that someone paid a large mark-up for a name. Because for me, names are worthless. As such, I probably would criticize someone spending $500 on jeans, because they are likely doing so for a name, not for cut or fit. $20,000 for a wedding is on the cheap side. What part of the country are you from where $20,000 is considered an “extravagant” wedding? In 2007 my fiance and I decided to quit our jobs, get married, and bicycle around the world for one year. We definitely caught a lot of judgment in terms of how we decided to spend our money. The one year trip ended up costing $40k (including all our gear, airfare, and day to day travel costs). We have zero debt and when we came home we had plenty of money left in the bank. Our friends & family were totally flabbergasted that we would spend $40k on a round the world trip. We had no problem doing it because we are super frugal people who’d been saving our money for years and years with exactly this type of thing in mind. We had regular good paying jobs (like 80 or 90k each) which I wouldn’t consider especially high salaries in the Seattle area. We rented cheap places, didn’t go out to eat at fancy restaurants, and didn’t buy expensive clothes or cars. We love to travel and wanted to quit our jobs and travel crazy places while we could. So we did. No regrets at all! Sarah, that’s so awesome what you and James did !!! I checked out your website and journal. I’ve seen quite a few Microsoft Employees do different, fun things like what you and James did. Good for you! And Congratulations on the Baby! Cannot WAIT for this post. I work with people who judge others for what they spend, and it drives me nuts. “It’s ridiculous to spend $100 for jeans.” (Yet they own an iPhone with no real business need to do so.) “I just think that rich people have enough money that they could give more to XYZ cause.” (Yet this person doesn’t give to the cause themselves–at all.) I really could go on and on with examples. I’ve shared a photo of an online item I thought was cool with a friend, only to be chastised for how expensive it was ($85 pants). If I shop at Old Navy and my jeans are stiff and my t-shirts unravel, that’s acceptable, but if I go to Nordstrom, even buying stuff on sale, that’s being foolish? Sorry people, but nicer stuff lasts longer and just looks better. You can pretend it doesn’t, but you’re wrong. Another one–yes, meat at the farmers market is more expensive, but so is having 500 TV channels. I choose one, you choose the other. I won’t tell you how dumb I think your expenses are if you’ll do the same. @AD People always underestimate the sales at major department stores! Also, no clothing related disaster make me angrier than having a shirt from somewhere like Nordstroms fall apart on me… after one wash. When that happens to a cheap shirt, oh well… you knew that might happen. At least it almost never happens and Nordstroms will let you return it. I will concur on the Old Navy stuff. Going even a little upmarket from there nets you clothing that will actually last. Old Navy is good for one season at most. After that, it’s generally pilling, probably has some holes and is generally ready for the trash, it’s not even worth donating to Goodwill. Also their shirt wrinkle far more readily than ones that you can easily find at the department sore for literally five dollars more (on sale). And to turn the tables, yeah, I do judge when people say they can’t afford something and I know they spend on other stuff I think is dumb. But hey, at least I keep my judgement and observation to myself, right? Keep in mind that people often just say they can’t afford something because it is something they don’t really care to do. This is often true even when they don’t realize that they wouldn’t do whatever even if it was free. People view other people’s hobbies as wasting good money as well, but won’t look at their own leisure activities. The gentlemen who commented about the Las Vegas convention is a good scenario. He likes to eat good food but not gamble, while his friends like to gamble and eat crappy food. It goes both ways, but each side must respect the other. When I see friends about to spend large sums of money, like buying a new carbon steel composite bike frame for $1000, I ask them three questions: 1) why do you need a new bike frame? 2) how iwill this bike frame improve your biking ability? 3) is $1000 a good price? Obviously, you can attach this to any situation or item. The key is in their answers. If my friend can answer these three questions with clear, informed answers, then I say go ahead and do it. Its their money, I just am trying to make sure they spend or not spend it wisely. One of the best characters I met in graduate school loved to deplore national financial problems (national debt, profligate government spending habits). He also constantly lamented our national consumer debt levels and happily cited the madness of consumer spending (which he tied to a decline in public virtue). He was a graduate student and had very economical housing: he and his wife split a house with another couple, living in extremely tight quarters. They had a beat up single car that they split, and seemed to be generally frugal people. Nonetheless, this man had a weakness for “heavily discounted” luxury goods. While this may sound like the ideal Ramit combination (spend on what you truly value, and cut ruthlessly what you don’t care about), it was a kind of dystopian version. He had spent his way into penury, forcing him into an insane lifestyle where he could barely make the credit card payments on his two maxed out credit cards, was accumulating a truly astonishing amount of student debt (both he and his wife are academics in the humanities), and once told me that he wouldn’t be able to eat for a week, because the institute on campus where we worked had screwed up his paycheck and it would show up two weeks late. He said all that the day after walking into work and telling me about the $900 jacket that he had purchased for a mere $175. This in addition to the $300 shoes that had set him back only $95. We both had crap campus jobs that paid us $13/hour. Unreal. Alternatively, I offer myself. I have constantly given others good investing advice (diversify, yadda yadda yadda) and my entire strategy was to be everything on Apple stock back at $52 a share. I sold it all at $250 and now have no idea what to do with my mountain of cash. I can’t bring myself to follow my own investing advice, but don’t dare succumb to any of the get rich quick investment schemes. I think it is important not to judge other people’s behavior or actions out of context. Ramit, I like your concept of intentional spending because it is something I use when I make my financial decisions. I have a great example of what you are talking about as well. My roommate and I went to Coachella this year. I was talking about my plans for next year’s festival and he told me it was too expensive. Next thing I know, we are passing by one of the art booths where he shows me the $800 worth of artwork he just purchased. One expense in his mind was irrational while the other made complete sense. And why was this? One was something I was spending money on and the other was something he was spending money on. I just shook my head in disbelief. I’m sure other people have already covered this, but I had a housemate who would criticize me and another housemate harshly for spending money on healthy food and nice clothes. She made fun of us relentlessly for getting shirts that cost $30 or $40 because that was soooo expensive, though she would spend about the same on 10 $3 shirts she would wear roughly the same amount as one of ours. She also went out of her way to prove that her prepackaged food was better tasting and just as healthy as homemade organic meals, because the boxes said “all natural” on them. I know we could start a whole debate about nutrition and taste, but the girl would eat Hamburger Helper and Hot Pockets for every meal, which are probably more nutritious than the keyboard I’m typing on and not much else. I judge people that spend a lot of money eating out at fast food joints and places like Applebees. If you’re going to eat crap food anyway why pay extra money for it? There are plenty of local restaurants with prices as good as Applebees and with much higher quality food. But this kind of our hypocritical nature is not limited to money only. We are born hypocrite…We deride every damn thing on this planet and we accept it behind the bushes! $20K may or may not be too much for a wedding. No right answer. Just make sure you understand the long-term costs – i.e., if you have 40 years till retirement and spend $10K on the wedding (thus saving $10K) you will have an add’l $160K at retirement. For the love of money is A root of ALL KINDS of evils. Much different meaning than the root of all evil. I love the Money Diaries because I can understand how and why other people spend and save money. Sure, I judge (we all do, don’t lie) but I try to judge it against my own spending and saving. I wouldn’t say others’ spending is frivolous and unnecessary but it may be unimportant to me, part of answering “What do you NOT care about spending money on?” My spending is in line with my values so the judgment comes from having different values. Your advise is always great, but I personally don’t read long posts 🙂 especially the monster ones. In my opinion smaller more direct post are much more digestible and memorable. I only judge people when I know their financial situations (I’m a college student; no one around me cares about people knowing how much money they have) and I know that they should not be spending their financial aid money on the ipad or online poker. If I see a woman with the latest Gucci purse that I know cost over $1,000, my attitude is more, “Oh snap! Good for her! I’m gonna be that lady when I get out of school and have a job” haha. I think it’s because I get judged a lot for my spending, because hey, I care about clothes and designers and such. So I know how it feels like to be spotted in a $200 pair of jeans and have people think I’m bad with my money; thus, I tend to give well-dressed strangers the benefit of the doubt. Well i have a friend who, i think has a plan on when it comes to his spending. It makes him cringe to no end everytime i walk in with new shoes/clothes. He wears the cheapest brand of formals known to man (cheapest in India!) the kind that colloeagues will laugh at….but wouldnt dare to laugh at him..he splurges on watches. has, i think, 3 rolexes, a briguet, brands i cant spell yet…basically a full on collection. this is a guy who thinks in 2010 that Rs.1200 for a pair of shoes is too much money. Food, watches and speed (as in vehicles) are his vices and he works very hard to keep them. I dont judge him because well, how can you? I don’t really judge people for how much they spend. I must confess that I am somewhat worried about my brother’s spending, but only in the sense that he doesn’t seem to be saving much. He makes a lot more than I do, though. I’ll happily confess to spending tons of money on my camera, and I’m going to save up tons more money to acquire a 500-700 mm lens (not quite sure how big the lens has to be) for the kind of photography that I really want to do. I’d also spend €1000 on a good pair of binoculars, but luckily the thrift stores here have no idea how to price good optics so I got mine for a steal 😀 My mom did in fact raise an eyebrow when I told her just how much I spent on this stuff. Fortunately, she knows better than to scold–she and my dad have been…shall we say, less than financially prudent these last few years. I’ve been judged to make an investment that wasn’t really clever, I know it now but wanted to test it anyway. I think that kind of money worth the lesson I learned and that it was better to test it when I was in college with no financial obligation. Apparently, my friends don’t think the same way. Well, I’m the one of us who have a good paying job that please me when they are still looking and hoping to find the perfect job. I’m sure that Ramit is going to create something great one more time and can’t wait to read it. Thanks for all Ramit. Ramit, just when I thought you were starting to go down hill you hit me with something interesting. I commend you on this post and I am very excited to see what comes of this. I find myself doing this a lot honestly so I’m pretty interested in what you’ll have to say about it. I judge and I jump to conclusions that are probably unfair. If I think someone purchased an item or service for their own pure internal enjoyment, I am usually happy for them. If I think they purchased it to show off, get external validation from others, or support an identity that seems inauthentic (e.g., suddenly he is “a watch man”) , I feel disgust or embarrassment for them. I guess my upbringing created a “conspicuous consumption = pathetic” schema. I do know that if I don’t see the internal value in the item/service for myself, I am much more likely to conclude a “look at me!” motive than an internal enjoyment one, so I have been trying to inquire more about a person’s true love of X to get a sense of whether it is genuine before passing judgment. But judgment’s come pretty fast and I know they color my conclusions anyway. ‘Judge not less you be judged’ is a statement not enough people remember these days. Especially Internet blog commenters. I think some of our spending justifications change as we feel we need something. In the case of the iPad, I would never buy it because I don’t plan on using it. But I probably wouldn’t judge someone who would if they think they would use it or need it? I agree that we all have the tendency towards this kind of judgmental hypocrisy, but I think often a big part of it is the blown-mind factor. Meaning, when you see someone spend a lot of money on something that you personally don’t, it’s just unfathomable how someone can afford that, because we’re thinking in terms of spending that huge amount PLUS whatever we personally spend huge amounts on, not INSTEAD of; we forget that there are things that the other person trades off on. And because we probably can’t appreciate the differences in quality in their big-ticket items, we can’t fathom how it could possibly be worth it to spend that much money on that particular thing, so it blows our mind that a hotel room could be worth $1000/night– it’s just a room with a bed, right? And, for those of us who grew up in low-income homes and who have always lived on a tight budget ourselves, it can be really hard to imagine having so much money that it’s possible to spend $400 on dinner without spending the rent money to do it. All we can hear in our heads are the voices of our parents telling us it’s irresponsible to “waste” money like that. Not that it makes it any less obnoxious, but some of this stuff is so knee-jerk ingrained from childhood that it takes a lot of conscious attention to re-program those attitudes. Very insightful, Rebecca. Thanks for your comment. Absolutely spot on about having to reprogram the knee jerk reaction to others’ wealth and spending. I have to walk myself through what X purchase is in terms of their net income. I had a general counsel one time that spent tens of thousands on an exotic wood walk-in humidor for his house. Insane. Irresponsible. Wasteful. His gross income? North of half a mil a year. Extrapolate that onto my GI? It becomes far less crazy. At least theoretically. And of course, my Mere Mortal reaction is that he bought a new midsize car to put his Cubans in. I had the opposite experience. My friend became upset with me because I am not into extravagant purses, spas, etc. I don’t like to waste my money on stuff like that. Why would I want a $400 coach bag? A $300 spa package? 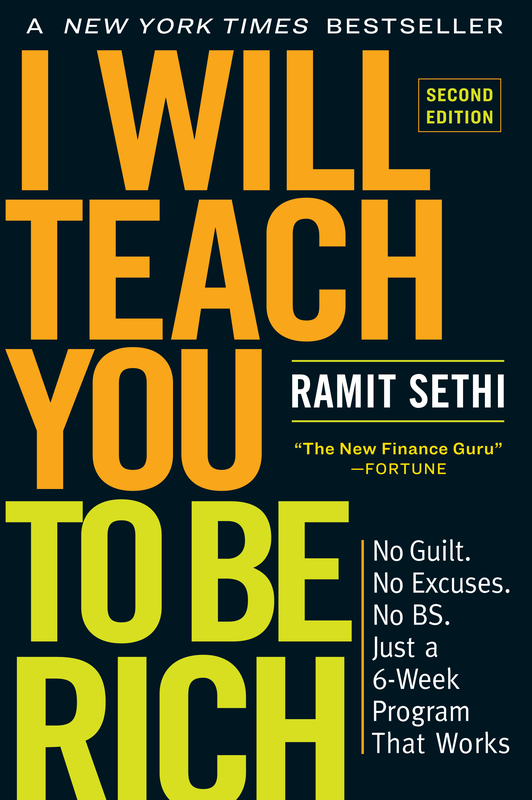 Ramit in your book you encourage us to spend on things that are important to us and spend less on the things that aren’t as important. I choose not to waste money on extravagant material things because I want to travel…. yes its only once a year but it is an amazing week or two weeks and I value that time to get away. How could a $400 coach bag compare to 1 week in Ireland? In my world, it doesn’t. When asked what I would do if given such a gift I replied honestly that I would take it back to the store and use the money to travel. Why? I never pay more than $25 for a purse or even a pair of shoes most times. lol. I save money on clothes, housing, and eating out, etc, so I can enjoy traveling and take my godson out occasionally. Life is good. I blamed my brother-in-law for spending 4000€ in purchasing and tunning a mountaing bike. That was until I went with him in a ride though the field. After the trip, every joint of my body hurt. The reason was that my “cheap” bike had poor quality pieces (Eg. : worse brakes, chain, seat, etc…). For him, it makes perfect sense to invest that amount of money in a bike, since every weekend goes for a ride. Of course, that is not my case! Sometimes you simply blame what you don’t know. I can definitely agree that people try to blame others but when it comes to themselves it’s a whole different story. I don’t understand it because it’s all the same: you are you and they are someone else. Of course, like many others, it all comes down to we all think differently and don’t want to think WE’RE the bad guys but THEY are instead. I say spend your money! As long as you’re not living paycheck to paycheck and not going into debt to consume something. I learned that I should never criticize my wife’s choice of hairdresser or the amount she spends on said hairdresser. Very much like the IRS, there is little room for negotiation and you are generally wrong, so you might as well just figure out what it costs and take it as a constant. I have a firm want/ need mindset for purchases. If I need it and can afford it I buy it; if I only want it but can afford it I add it to my wishlist – that list gets whittled down by one item twice a year – birthday and christmas. I love adding things to my wishlist – it’s almost as much of a buzz as actually purchasing the item and the best part is it means family and friends can help me curb my spending because I know the things I want will be bought by them on those special occasions.. I agree with Vic, the want it/need it mentality is the best to have & the adding it to the wishlist is good too! Thank you for sharing your article! Yeah, we totally judge my brother-in-law and his wife. He was out of work for a year, got part-time seasonal work at the mall, got laid off again, is doing census work, then will be unemployed again. And what do they buy? Basically whatever they want. A fancy new computer, new wedding rings, trips to the movies on opening night (in southern California, where the price for the two of them would buy the DVD, ugh), etc. They have thousands and thousands of dollars of debt…and just moved into a place that’s more expensive. But it’s closer to their parents, so it’s easier to mooch. I, meanwhile, am wearing a plain $85 wedding band because we couldn’t afford diamonds, but all we owe is our mortgage and a little on my husband’s vehicle. That said, sometimes you have to spend the money. My grandma died and we realized we couldn’t get home for the funeral, and I was a wreck. So my husband took me out for mani-pedis. Could we have spent the $150 better? Yes, but it probably wouldn’t have been nearly as beneficial to my sanity. I’m 18, my mother got me an 800€ guitar. My friends all tell me how selfish I am when they, even the ones who actually want to be guitarist, have 200€ or 300€ guitars, while I have that really good one, even though I’m really a violinist. But my parents knew I’d make good use of it, and they could afford it, so my mom got me an awesome birthday present. Though usually, they shut up once they know the sticker price was 1100€, and my mom negotiated not only the price but also got a free amplifier and guitar case. Lawyer mom FTW! This is a perspective and frame of reference issue. This is outlined in “why smart people make big money mistakes.” Basically you will always over value some thing of your own personal interest such as something you are selling, but if you were buying the exact same item you would undervalue it. Same thing here you devalue the factors behind another persons purchase, but you overvalue or try to justify your own purchase. I definitely judge anyone wearing expensive jeans that look horrible on them. My internal monologue generally goes “you might want to check yourself out in the 3-way mirror BEFORE paying $300 for jeans.” If they are wearing expensive jeans that are cut well for their body, I just think that they look good and probably don’t even notice the brand. I also roll my eyes at the “logo” purses/shoes/whatever, but mostly because I think that they look tacky and very nouveau riche. I also definitely judge one of my friend’s friends who would always go out to the bars with us, rack up a $50-60 tab (plus a run across the street for another pack or two of cigarettes), and spend most of the time whining about how she could not afford groceries. The fact that we always had to sit outside so she (and no one else) could smoke (regardless of wind, rain, heat, cold, or dust storms) probably didn’t help. I’ve been on the receiving end at least once (probably a bit more, but I tend to be rather oblivious to others’ opinions of me). A former lab partner and I were working on a report and I mentioned that I’d spent about $50 on what is essentially a gussied-up burlap sack to shove my knitting in. I was excited as it was exactly what I wanted and I’d been trying to get my hands on one for a couple of months. He was quite unimpressed that I was willing to spend $50 on the aforementioned burlap sack. Last weekend I went into a Coach store, carrying my Coach handbag. I was looking for a present for my little sister’s birthday. The snotty b$%@ who was ‘helping me’ was kind enough to point out that my Coach bag is from an outlet store. Yeah? So? The bag when I purchased it has a MSRP of $398. I got it at the outlet store for $110, with a 25% off coupon, making my $400 bag just over $100 after tax. It’s made of the same super high quality leather as all of the other Coach bags, I just happened to get a deal. I was flabbergasted that someone who works in retail at a shopping mall (how much could she possibly make?) had the never to judge me because I have enough senese to get a deal. I love the quality of Coach leather products. I will continue to enjoy them- at a discount when I can. I just ask that if you see me on the street, and happen to notice that I’m carrying a Coach outlet purse, please keep your judgement to yourself. If my husband and I are on a trip, we will spend $100-200 on a nice dinner one night. But we don’t go to museums, we don’t buy admission tickets to events or clubs, we don’t spend $20-30 eating eggs at a diner. But we like a nice dinner. We like walking around and watching people. We like sitting and enjoying new views. And in general, we don’t shop. If his brother is on a trip with his family, they stop every hour at McDonald’s for a break. They like to shop for bargains, so if he’s in the mood for ice cream and the shop they stop in has a buy 2 get one free ad, he’ll buy three – even though it’s just him eating and he doesn’t have a freezer. If his daughter wants a lip gloss, and the sign says buy 2 get one free, she’ll buy all three even though she only wanted one to begin with. If his girlfriend sees a shirt she likes…etc etc. By the end of the day, they will have spent the same amount of money as we did – it’s just that we spent ours on a dinner, and they spent it on little things throughout the day. So what’s more important? This is what people judge – I judge them because they spend money on things I consider to be silly, and they judge us because they think that much money on a dinner is silly. It would be best for everyone if we all minded our own business and spending habits. That said, please do not expect me to subsidize or underwrite your foolishness or irresponsibility through my taxes, or other forms of government theft; i.e., bailouts, subsidies, welfare, food stamps, Section 8, green-taxes, etc. Remember when John Edwards was running for president and the news got out about his $400 haircuts? It probably cost him the nomination. I think everything’s ok if you can afford it(not charge card debt). We are all different, even if I won the lottery I would spend more on books than on clothes and would still hate to buy anything that was not on sale. I love the diversity of this conversation about money and hypocrisy. I’m doing a 12 month personal challenge at the moment — my year without clothes shopping. It started out as a financial thing, but the really interesting stuff that’s come up for me has been around the emotional part of shopping. Why would I feel compelled to spend more money on clothes, when I have plenty of everything already? What’s that really about? I recalled my last big shopping trip (Nov 09) and every thing I purchased was a “justification buy” — I didn’t need any of it, but I justified everything I bought. It kinda shocked me into a wake up call, really, which is this year long challenge I’m 5 months into. I’m still working out what it all might be about. Money and emotions are really tightly woven topics. Ramit, I’m really interested in how your monster post shapes up! My struggle is with a co- worker and others who have such a different cultural approach to money and possessions that it is a struggle to know when to judge. For them, it’s not ‘I got paid today’ but ‘we got paid today’. It’s not ‘I blew it all on the one day’ so much as ‘I spent it before everyone else bled me dry anyway.’ (I’m paraphrasing here). So maybe the lack of any savings can be looked at as being incredibly rich in social capital. Sure, my co-worker has no cash savings, but there is an extended community who will feed and house my co-worker if needed instead. Am I being greedy, saving up to pay off my house and put some money towards my own retirement, knowing that this money is (literally) a lifesaver for others? I ask myself this daily, with different answers. I agree that people are hypocritical with money and I enjoy reading tips on how to save it wherever I can. One site i found was by Sheri Mattingly-Bevan and I would like to share that if I could. You know, I don’t really mind at all when people spend money on the things they want. If they can’t do that then it defeats the purpose of money in my opinion. What’s a pet peeve of mine however is when people spend money that they don’t have on things that they want. I still believe that money shouldn’t be borrowed for consumption, only for investments. Otherwise its the bank, not you, that wins. I think it comes down to the part of human nature that the copywriters exploit: People make decisions based on emotion, then back them up with logic. And we can get really creative with that logic to justify ourselves after the fact. The best way to motivate people to save money is to appeal to their emotional wants and needs and to connect the idea that saving money will give them what they need to fulfill them. Of course, copywriters do the opposite. They appeal to wants and needs and connect parting with your money as a way to fulfill them! I think there is hypocrisy in the comparison of someone else’s overspending. However, and maybe this isn’t relevant, I also spent time with a friend just yesterday who i could actually *feel* the derision and superiority coming off of her as she bragged about how cheap *all* of her clothes were and also how *few* clothes her two toddlers had. I think the problem is less the hypocrisy of it and more the underlying judgment call we all make. LaughingMouse, so true. Stay tuned this week for a long article on our hypocrisy when we judge others’ spending. LaughingMouse, I’ve seen the same kind of judgmental behavior in far too many personal finance blogs, including in the comments section. I have a pricey designer purse that would make a lot of frugal people throw fits. But I saved up for it, paid cash for it, and have worn it every day for the past five years and it still looks new. I don’t care how other people spend money. It’s none of my business. People seem to forget that personal finance is personal, first and foremost. Rebecca’s comment is spot on in my opinion. My friends once could not understand how I afforded a fancy-pants 3 day spa vacation, but the fact is that I had saved for it with the money I don’t spend on the iPhones and cable TV that they all have. I had others still that told me how I could have gone on a longer trip or traveled further (I only went a 2 hour drive away) for the same amount of money. For me the 3 days was about relaxing, unplugging and being completed pampered – Europe would have been nice, but I’ve done the dirty hostel thing and it wasn’t what I needed at that time. I’m planning on doing the same vacation every few years because it was that amazing – but I’m willing to give up other things for it and that’s the difference. The have-nots always seem to get upset when the haves spend frivolously… but we all do it at our own level… I spend $4 on a latte, while Paul Allen spends a billion dollars on a yacht. I agree with the lady who said sheś spending an enormous amount on her big wedding. As loads have mentioned, one´s personal taste and desires are a key factor. You only get married for the first time once in each lifetime;) so why not blow it all out…assuming then again that you can afford it…if not at present, then can you hold on for a little longer while you get things sorted?…might be well worth the wait. Well I think its funny, cause people love to poke fun at me for being frugal, but you know what, when they are begging me for money later on for a bail out lol,, I will be the last one laughing. I already have friends who come to borrow money from me, but where’s there savings, hmm I have no pity for them. My boss makes 5 times as much as I do and has less money saved than I do, How can that be, and criticizes me cause I don’t waste money at all. I say if you don’t need it why buy it, most times things we need like material things, someone else is throwing away anyway, and there I go not having to buy something I needed and saving my money and using what was being discarded so the other people can keep up with the jones’s. I love these hyper consumer folks they help people like me keep all my money, lol so keep spending every dime, someone else will be living off you when you decide to buy the latest and grestest new toy on the market. Be happy with yourselves people, and stop looking for happiness in toys, geesh..